The Cheney Stadium site was rebuilt with green infrastructure, complete streets and power conservation. Parking was increased, pedestrian walkways provided and tree canopy was improved, while reducing the paved surface and impacts on stormwater. This demonstrates that a sustainable approach can exceed the property owner’s needs at an affordable price. Trying to make paradise out of a parking lot might seem like a stretch. From a stormwater perspective, the Cheney Stadium Sustainable Stormwater Project's porous asphalt and other green infrastructure are as close to forests and fields as an urban area can get. Watch a video to learn more about porous asphalt. Revamping the stadium’s Tyler Street entrance. The result exceeded the City’s vision of sustainable stormwater management for a large impervious commercial site by taking a holistic view of the site and incorporating other sustainable elements. It’s a model that the City of Tacoma’s Environmental Services Department hopes to promote in other commercial developments in Tacoma. The project includes approximately six acres of permeable pavement, an infiltration trench, three bioretention rain gardens, sustainable landscaping, and seven acres of new tree canopy. These elements combine to allow the rainwater from eleven acres of the stadium’s parking lot and entrance roads to be absorbed into the ground. The primary objective for this project was to infiltrate as much water on-site as possible, improving flow control and water quality downstream in Tacoma’s Flett and Leach Creek Watersheds. The stormwater leaving this site travels through ten miles of storm sewer and through four city holding facilities. It is pumped into Flett Creek and then into salmon-bearing Chambers Creek prior to discharging into Puget Sound. This project is part of a larger initiative in the Flett watershed to infiltrate stormwater wherever possible, thereby removing it from the system and reducing the volumes discharged through the Flett Holding Basin, which is increasingly overgrown and limited in capacity. 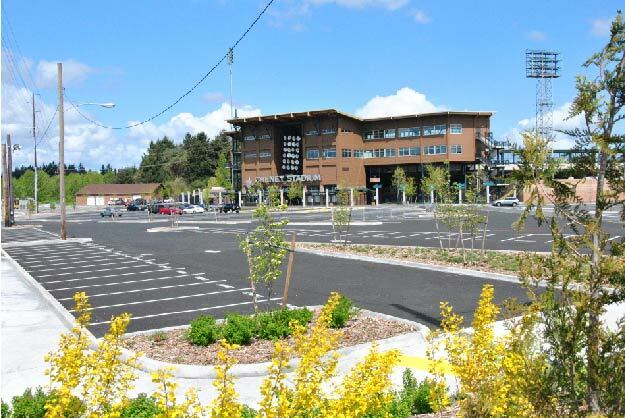 This site provides a unique opportunity to convert a failed parking lot and paved roadway into a stormwater treatment retrofit using green infrastructure design. This reduces surface water runoff and the load of fine particulate matter that enters the watershed. Initially this project was estimated to reduce the stormwater leaving the site by 66%. However, over the past two seasons, the site has far exceeded the modeling predictions. Further monitoring and evaluation is underway to determine the full effectiveness of this site, which has very poor infiltrating soils at approximately 0.05-0.25 inches per hour. Managing stormwater at Cheney Stadium in the headwaters of this watershed is imperative to the future health of these sensitive receiving waters. Cheney Stadium is now a model that can be used for many commercial developments. Tours of the site clearly demonstrate how incorporating green infrastructure with an overall sustainable approach exceeded the needs of the Tacoma Rainiers and their fans. This design increased parking, provided pedestrian walkways and expanded tree canopy, while reducing the paved surface and impacts on stormwater. The City of Tacoma’s innovative surface water efforts, such as this Environmental Services Department project, have made Tacoma a leader in green infrastructure. Greenroads is a sustainability rating system for roadway design and construction. It is a holistic approach that evaluates all impacts of a road, far beyond stormwater impacts and green infrastructure. Clay Huntington Way was honored as Tacoma’s first Greenroad. Clay Huntington Way achieved Silver Greenroads Certification, helping make Tacoma home to the highest concentration of Greenroads certified projects in the world. Wide sidewalks were constructed on Clay Huntington Way and the entrance road from Tyler Street. Improvements were made to help pedestrians walking from the Scott Pierson Trail to the Stadium entrance. The stadium now has three dedicated pedestrian walkways. Clay Huntington Way was widened, shared bicycle lane markings were added, and bicycle racks were installed at the north ticket entrance to improve bicycle access. Clay Huntington Way was one of the first LED light pilot projects for Tacoma’s Public Works Department. The energy-efficient light-emitting diode streetlights were added from South 19th Street to the north ticket entrance at the ballpark to increase pedestrian safety. These lights have reduced power consumption for this street by approximately 50 percent. Two electric vehicle charging stations were installed in the north parking lot to support Tacoma’s electric vehicle infrastructure. Sustainable landscaping minimized the need for irrigation and maintenance by planting a dense tree canopy and drought-tolerant plants. This project was constructed in two phases with a total of $3.1 million in construction costs. Traditional stormwater improvements to achieve equivalent mitigation would cost nearly double that amount. This project was partially funded by a $1 million Washington State Department of Ecology grant. Tacoma Power also contributed a rebate to offset the cost of the LED street lights on Clay Huntington Way. Through Charge Northwest, the electric car charging stations were provided at no cost to the project. The rest of the funding came from the City’s surface water fund. Geotechnical: Landau Associates, GeoDesigns Inc.
Cheney Stadium has provided the opportunity to reach out to thousands of baseball fans all over the Puget Sound to spread the stormwater message. As the public enters the stadium, the street lights host banners that highlight the project’s sustainable elements. There is also a project sign located at the north ticket booth to inform interested baseball fans about the project while they wait in line for tickets. The regional stormwater campaign, Puget Sound Starts Here, has hosted several nights at the ballpark and provided information and give-away items to fans. When the project received its Greenroads Certification, the Rainiers held a presentation on the field during the pregame ceremony. Clay Huntington Way is highlighted as a featured project on the Greenroads website. The City also hosts a Greenroads website where this project is featured. The City of Tacoma and Icon Materials received the 2014 Special/Innovative Use of Asphalt Pavements Award from the Washington Asphalt Paving Association for the porous asphalt installed at Cheney Stadium. This is the first porous asphalt project to receive an award by this association. This project scored high on innovative because in addition to using porous asphalt, it also utilized an asphalt treated permeable base to improve construction and provide additional strength. Tacoman’s can view this project in the west half of the Cheney stadium parking lot. This award along with Environmental Services Department’s leadership in establishing state specifications for permeable pavements puts Tacoma at the forefront for permeable pavements. Sustainable elements of this green infrastructure project can be incorporated in a variety of commercial sites and street projects by both public and private entities. Developers, consultants, the Washington Soil Scientists, and several student groups have toured the site. Environmental Services plans to continue to host tours of the site and share the lessons learned from this project. Tacoma is currently working to host a regional workshop regarding the development of a standard specification for pervious pavement.